If you thought a Natalie Portman movie about a pop star would be fun, think again. Vox Lux is a curious mix of Hollywood blockbuster and ponderous art film — the kind of highbrow trash that's aggressively pretentious, yet also has cheesy musical sequences. The movie is given pop star authenticity by Sia, who wrote a number of banging dance tunes to be performed by Natalie Portman's character Celeste. But long before we get to that, we hear some very verbose narration from a craggy-voiced Willem Dafoe, as well as a grim, frighteningly realistic school shooting. A teenage Celeste (Raffey Cassidy) is injured in the attack, and after she performs a touching tune at a vigil, she is thrust into the spotlight amidst an outpouring of public sympathy. She quickly lands a record deal and is given a crash course in the music biz by her manager (Jude Law), while her older sister Ellie (Stacy Martin) offers her a gateway into a world of partying and excess. Flash forward 17 years and Celeste is still famous. I don't want to give too much away, but let's just say it goes about as well as you'd expect for someone who's been famous since her early teens. Like Britney or Bieber, she's both totally insufferable and deeply sympathetic, and Portman's unhinged tantrums are something to behold. There's a dark, self-serious quality to Vox Lux, even when its costumes and characters are outrageously satirical. The spaces between pop songs are soundtracked by Scott Walker's jarring score, and urban establishing shots are audaciously long. There is not one but two scenes involving chilling mass shootings, plus a bizarrely long concert scene and a very abrupt ending. Tonally, it's all a bit of a mess, but that's part of the point: tragedy and entertainment are intertwined, and the media ruthlessly exploits suffering for eye-grabbing headlines. The more fucked up something is, the more we're fascinated by it — good taste be damned. 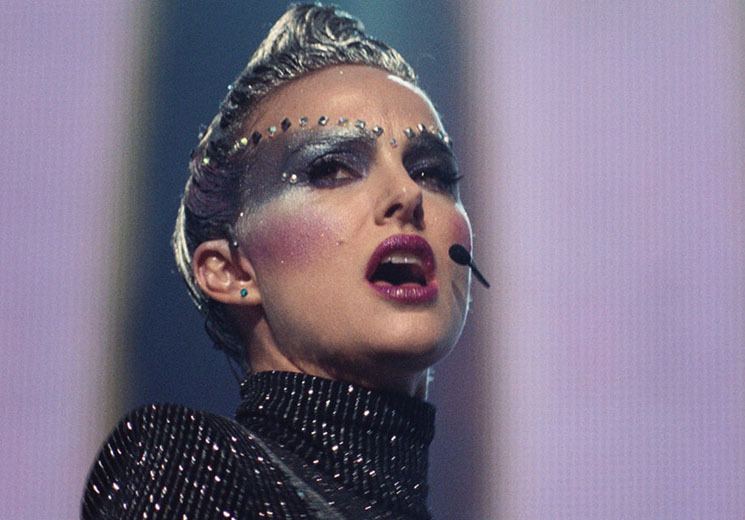 And the proof's in the pudding, since Vox Lux is extremely entertaining.